Growing up in Grand Blanc, Mike Herriman admits that there was a time he didn’t even know where Davison road was. Now, Flint is home. And, it is his passion. Herriman is owner of Vern’s Collision and Glass, founded by his father more than 40 years ago. With the help of his wife, both of his sons, and one grandson, it is a family business—and a cornerstone for this neighborhood because his work goes far beyond cars. Even the auto repair shop has a neighborly feel with honey on shelves along the office walls, three sleepy dogs, and an always-smiling face behind the front desk. Herriman also runs a crime watch committee, works with the College Cultural Neighborhood Association, is an active participant in two networking groups, and volunteer coordinator for Flint River Watershed Coalition—recruiting businesses, neighborhoods, community groups, and local schools to help clean the Flint River. Vern's Collision and Glass on Davison Road is home to repair work and a ton of community volunteer work. “On a regular basis, he is standing up and telling us about some other kind of event that he is involved with, and I think that he does it so consistently, and it’s not that he’s doing it to say, ‘hey look at me.’ It’s: ‘I’m really interested in serving the community of Flint,’” said Bob Wright, owner of Complete Wealth Advisors and member of the local Business Network International chapter. Basically, whenever there is an issue, the neighborhood knows it can turn to Herriman—whether it is code enforcement or neighbor disputes. “There’s a lot of things that need help with that aren’t crimes, but if you don’t address even a small problem it can develop into a crime,” Herriman said. Herriman has been involved for more than 20 years with BNI, a business and customer referral networking group. “He really is the leader of our group. He brings the most visitors. He’s the most involved. He really works hard to give. He thinks of all of us all the time and he doesn’t ask for anything in return. He just keeps looking out for us and in turn we try to help him as much as we can,” said Mike Rogers, a BNI member and the owner of Commercial Graphics. Herriman is also on the advisory board of the Baker College Automotive Department and does training for rain barrel building. Both of his sons are firefighters in the Genesee area, his grandson volunteers and works at the company, and his wife is a master gardener who also volunteers at Applewood Estate and Crossroads Village. Sometimes, it seems, the family is everywhere, doing everything. Herriman said they just want to help the community and help others see how they too can make a difference. “Most people want to do something, they’re just not sure where to start, who to start with—so typically, given an opportunity to do something, they will,” Herriman said. 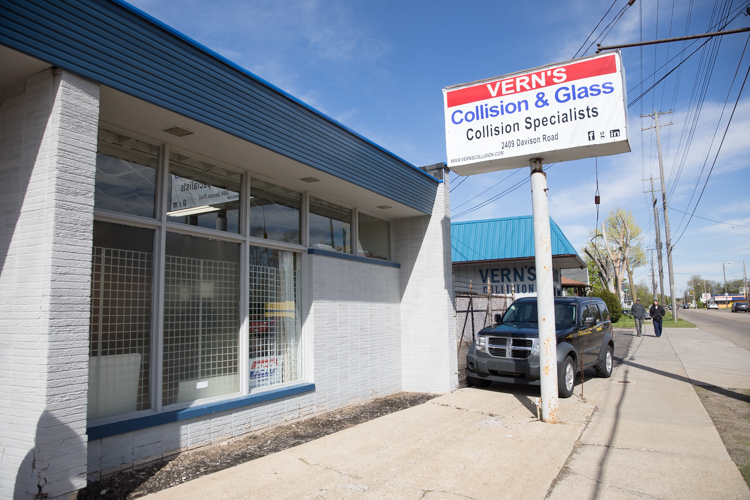 Vern’s Collision and Glass is located at 2409 Davison Road. Hours are 8 a.m. to 5 p.m. Monday through Friday with extended hours by appointment.